This year’s Queen’s Exhibit will highlight decades of memories that were instrumental in making the festival such a beloved event. A hidden treasure of the Florida Strawberry Festival is found encased in a roped off corner in Neighborhood Village. When guests walk through the door next week, they will come face to face with a shimmering red gown, a red carpet and an exhibit celebrating years of strawberry royalty. The Queen’s Exhibit is maintained by Marsha Passmore and her sister Dodie White. Each year, the duo comes together to revamp the showcase around the festival’s changing theme. To highlight the “Building New Memories” theme the exhibit will feature building blocks, hard hats and tools. The pictures on the far wall rotate every year as do the featured end caps. The current queen’s dress and a former queen’s dress, or other festival-related items, line each end of the exhibit. This is also the first year it will feature the trophies won by the current court. The official exhibit in the Village is entering its fifth year and no one appears to be a better fit for maintaining the treasured homage to the past. As Passmore and White passed by each picture of a former queen and her court they began to share anecdotes of growing up around the local royals. Though the duo admits this job could be done by someone else, they are quick to say no one’s heart would be in the process more than theirs. 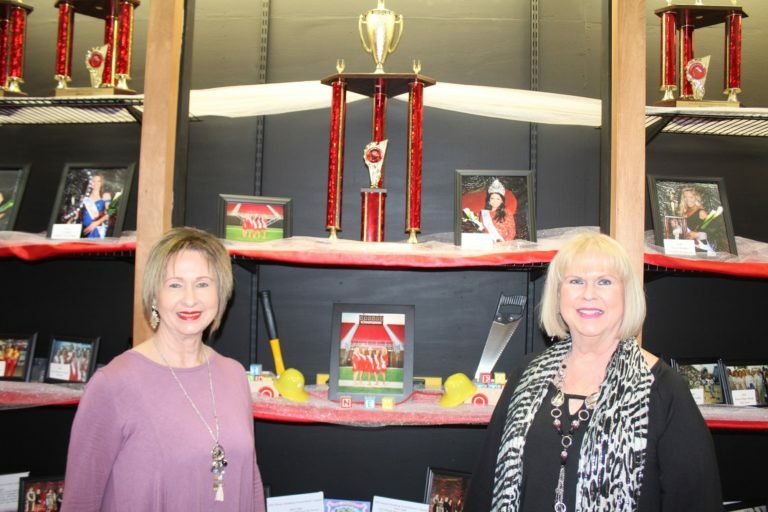 Passmore and White have been attending the festival since they were little girls and their love of the queen and her court has only grown over the decades. If they don’t know the queen they are sure to know her family. One of their favorite parts of running the exhibit has been getting to know the young winners that they’ve so far only known in passing. As soon as each year’s theme is announced, the sisters begin planning out their exhibits. Year after year it is revamped to keep the experience fresh for the festival’s regular attendees and still exciting for those coming for the first time. Throughout the festival, Passmore and White will sometimes walk among the pictures and listen in to the comments of those passing through. It’s their way of getting honest feedback and they said they also just enjoy hearing attendees share stories of the royals they recognize. One day, they plan on passing the reins over to someone new. They both agreed that the time will come when they can no longer come up with fresh ideas. Rather than let it become stale they will hand it off to another leader.